Pay attention, kids. This is a real computer. 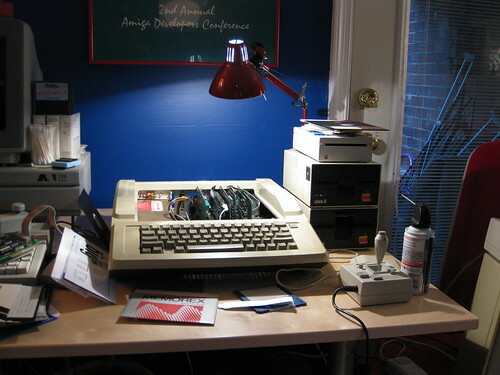 (Oh, yes, and if there weren’t already enough computing geek cred in this shot, check the Amiga developer poster on the wall.) Photo (CC-BY) Blake Patterson of ByteCellar.com. iPad, wha? 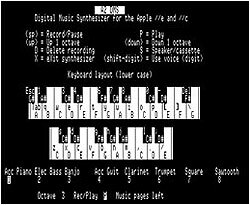 How about new music creation software for the Apple II platform? Get over the novelty, and there’s something happening here: recycle old equipment otherwise destined to be toxic waste, make a computer instrument that’s dead-simple to use onstage and doesn’t require looking at the screen, make the most of extremely limited resources rather than burning through computing resources arbitrarily …these are principles that could be applied to any computer music project. Up to 8 voices, preset sounds (Acoustic Piano, Vibraphone, Acoustic Guitar, Electric Bass, Trumpet, Clarinet, square wave, sawtooth wave, sine wave, Banjo), monophonic QWERTY performance. Now, admittedly, the Apple IIe isn’t much fun to take to a gig. Look for the Apple IIc, a svelte, slim design that was easily one of the best designs Apple has ever made, in any decade. When you do need video out, plug the analog jack directly into a TV, then stare into your soul (or your HDMI-connected, content-protected, latency-inducing TV) and ask yourself what progress means. There are also a couple of iPhone apps, but… that doesn’t have the same cred, somehow. It’s a worthy question, though: can a computer last you as an instrument for some 25 or 30 years? I have to take issue again with Gino Robair, who repeats the lament that computers lack longevity. I couldn’t agree more, Gino, that computer’s lives are too short, reliability too low, and repairs to difficult, or that the onward march of software requiring replacement systems is absurd. Gino also talks about “renting” software, but doesn’t address the existence of open source tools, and indeed, tools like Csound and SuperCollider have new longevity. We likewise watched Hans-Christoph Steiner rescue bins of old PDAs and iPods others thought were literally trash, in order to run Pd. 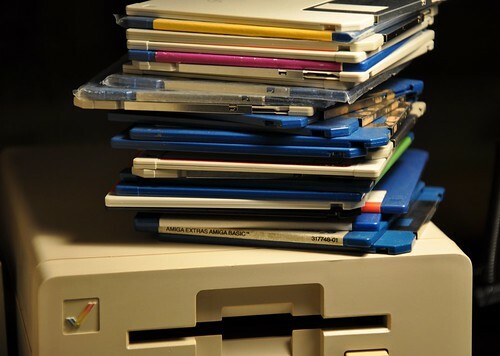 Nor does commercial software have to be excepted from this, just because of its upgrade-cycle business model: just as hardware manufacturers now consider the impact of their goods as waste, software developers could thoughtfully end of life discontinued products, and use copy protection that has a statute of limitations instead of planned obsolescence. Most importantly, though, Gino I believe incorrectly assumes that hardware will last people forever. On the contrary, on CDM, I regularly encounter people who are selling and trading in those beautiful boutique hardware synths, because they find they don’t need all of them. Likewise, you’ll find people working with DSP systems for many years, or even maintaining an old Be computer or mobile device. These are essentially software, used in a specific way because the user so chooses. Software itself is not to blame: planned obsolescence, inferior hardware, botched copy protection, greedy resource consumption, and overly complex software rigs could be. That to me is the lesson of the 8-bit musician, which transcends just a fondness for old sounds. It’s just as much about doing more with less. That’s not a technological principle; it’s a creative one. It could be as simple as saying, you know, today I’m going to focus on this one tool and one option and not let myself get distracted by the others. Maybe it isn’t the computer that’s the limiting factor, after all. Maybe it’s us.